As discussed in our other journal posts, we’ve touched on the numerous activities which are available during the summer. From foot, to pedal, to water, there truly is something for everybody in the summertime, but let us not forget the ‘Grand Evenements’. As with the winter, the resorts host and create various events over the predominant summer months of July and August. These include national festivals, local celebrations and also various sporting events. We’ve done a round-up of the events which are standing out the most at the moment, and you can also get access to each of the tourist board websites to find more information. Look out for our upcoming blogs over the next month with events in Morzine and Val d’Isére. 21 June – Fete de la Musique. Evidently, this is a particularly good fete for those of you who like a dance or live music. Most of the bars that operate in the summer will get involved for this one, expect sunny sets and cold wine on tap. A lovely afternoon and evening wherever you may be celebrating. 14 July – Fete national. Many of the French fetes follow a fairly similar process, check out your local area for more information on what exactly is going on. 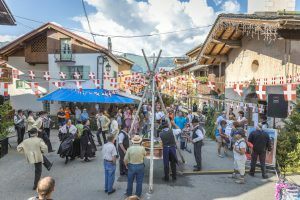 Some towns celebrate more than others, but most will do something traditional, especially in the Savoie areas. 4 & 5 August – Fete a Fanfoue. Our personal favourite festival of the summer. This one is local to Les Allues in Méribel and is a celebration of the history of the village. The locals will trek the old route across the valley dressed in traditional clothing and eventually end up in the little village below Méribel. Expect the ancient bread oven to be fired up, live music and lots of dancing! A great one if you’re interested in the history of the town, and especially if you want to get involved with the local French people. 7 & 8 July – 3 Vallées Addict Tour. One for the mountain bikers, or those who like to watch! The opening weekend of the lifts will be celebrated in each of the resorts across the 3 valleys. Expect BBQs, mud and mountain bikes! 7-20 July – Zen Altitude. Start the summer off right with various wellbeing options from Yoga to relaxation and massage. Various events and taster sessions will be running on a daily basis. For later in the summer, don’t miss the Weekend Yoga & Nature – a weekend jam packed with dance, movement, yoga and wellbeing. 14 & 15 July – Coupe de France de VTT Trial. 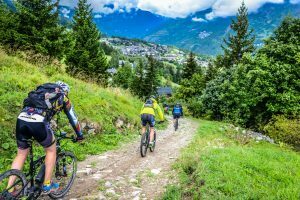 The French Mountain Biking Cup is definitely one to watch if you’ve got an interest in mountain biking or have children with you! Click here for full details, but expect a range of entrants, from youths to women and men, and even some demonstrations from previous champions. 16 July – Pêche à la Mouche – Trophée de Méribel. Fly fishing! Fishing in the lakes of the valleys is a popular past time in the summer. If you want to ‘dip your toes in’ there are various clubs you can join. This link has very little information at the moment except the date so keep an eye on the website for more information. 26 July & 9 August – Méribel Cyclo. A right of passage for all road cyclists in the valley. Start at Les Allues (1100m) and partake in the climb up to the Altiport (1720m), and go as fast as you can! 11 & 23 August – Kilometre Vertical Trail. Similar to the Méribel Cyclo, but for runners. Starting on the Mottaret ‘snow’ front, this run finishes at the Petit Saulire. Do not be fooled by the short 2.5km of this trail run, as it packs an almighty punch of 1000m elevation! The fastest time in 2015 for men was 41m50.5 by an Austrian chap, and 53m15.4 by a French lady. 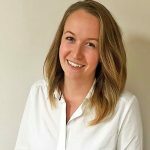 18-22 August – Méribel Golf Pro AM. A friendly mixture of pro and amateur players come together in an impressive group of 30 teams for this event. If you’re interested in golf, make sure to check out the golf courses across the valley, to play with an unbeatable view. Another event to watch is the Koehl Assurances Méribel Golf Trophy which happens at the end of August. 23 August – Tour de l’avenir. If you like cycling, atmosphere, young hopefuls, sport of any sort, beer, wine, or basically…anything, then this is one for you. We’re super excited about this event. Translated to ‘Tour of the Future’, the best way to describe this event is the Tour de France for under 23s. This is the place to see the cyclists who one day may make history. 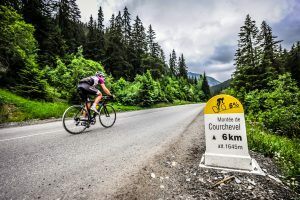 On the 23 August they will start in Moutiers, travel up to Montagny, down to Bozel and Brides les Bains, and then travel up past Les Allues to finish in Méribel. Expect people lining the roads, and a fantastic atmosphere at the finish line. Grab your coolbox and definitely head out to spend the day watching this one – you will not regret it. The big news this summer in Courchevel, if you missed it, is that they’ve made all of the lifts free for the whole summer. The La Tania bubble has always been free in summer, allowing people to easily pop up to the Bouc Blanc restaurant for lunch, but this year they’ve rolled it out across the valley of Courchevel. The beauty of this is that you can easily justify taking a quick trip up just one lift for a picture of the view, or you can spend your whole day just riding around animal spotting, for free. 21 July – Red Bull 400. You may have seen the video of this that went viral last summer. If you’ve been to Le Praz then you’ve no doubt seen the towering ski jumps, and you may have noticed the gruelling amount of steps that run up alongside them. You guessed it, the Red Bull 400 is possibly the most gruelling 400m running race in the world. At a gradient of 36 degrees, this is sure to burn off the kilos of tartiflette you ate in the winter. 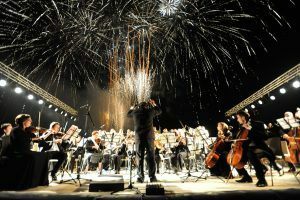 25 July – Pyro Symphonie Live. Imagine a beautiful live rendition of Tchaikovsky’s Nutcracker Ballet, and then picture it at night, accompanied by fireworks, stilt walkers and lights. This is a free event, that is not to be missed. 10 & 11 August – Ski Jumping World Cup. A yearly event for Le Praz, with free entry and food/drink stands this is a great morning, afternoon or day out for all of the family. Truly impressive heights and distances. You could even take a picnic and watch. Smaller on the scale of events, St Martin sticks true to what people love most about this little village; tradition. Expect to learn more about culture and history of the area, and the chance to try your hand in different art and craft activities throughout the summer. 23 June – Tour Savoie Mont-Blanc. Normally a race for the up-and-coming younger teams, this year they will be joined by 5 professional teams. Starting in Chambéry and finishing in St Martin, a road race atmosphere not to be missed as they finish their 185km stage. 18 & 25 July – Tournois de pétanque à Brelin. When in France, we pétanque! (A game of boules). Open to all, and a tradition not to be taken lightly. Forewarning, this comes with the highest respect in France. Terribly frowned upon to laugh about it or not play the game with your whole heart and soul. Throughout the valleys you’ll find designated pitches for this. It’s a perfect game to play with an apertif before dinner, or in the late afternoon sun, whilst you’re on holiday. 30 July – 3 August – Semaine des arts du cirque. This is one that we’re really looking forward to. A week for 8-12 year olds to get involved in all things circus, and a grand show at the end of the week. There are various children’s events on throughout the summer in St Martin, and I would go as far as to say that they out-do Méribel and Courchevel in that respect. Check out the website for more information.